On a recent trip to the Czech Republic, I did what a good tourist does. I walked up and down cobblestoned streets, trying my best to say one or two phrases in Czech, and purchased goodies from the local shops that cater to the tourists who visit Prague in droves. While trekking up a very steep ancient street, en route to Prague Castle, a used bookstore lured me inside with the scent of old books. Rather than try to find the English language section, I satisfied myself by looking at picture books, antique postcards and collections of photography books. I wondered at the lives and the stories contained within the bindings. My fingers trailed lovingly over the spines of the old books and I suddenly caught my breath when I spied a small black tome decorated with illustrations of clovers and daisies. 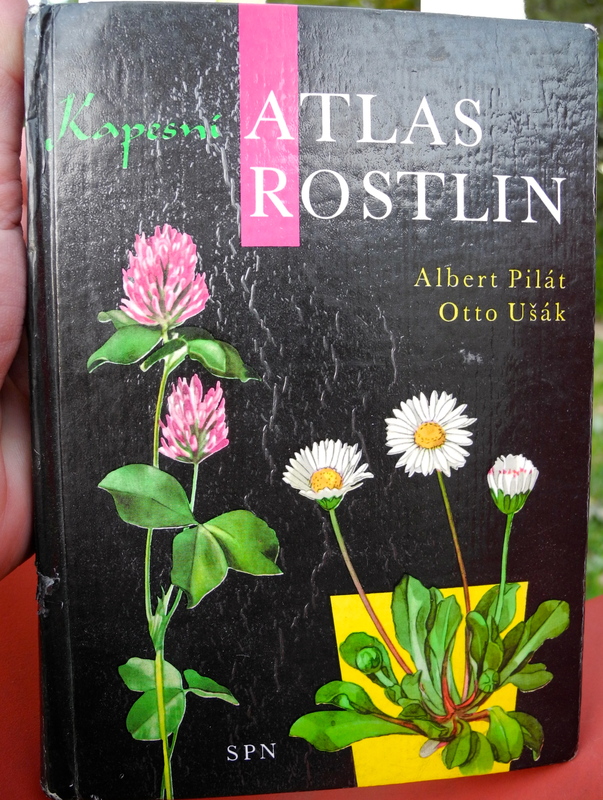 The book, entitled “Kapesni Atlas Rostlin”, by Albert Pilat with illustrations by Otto Usak was published in Praha, 1963. 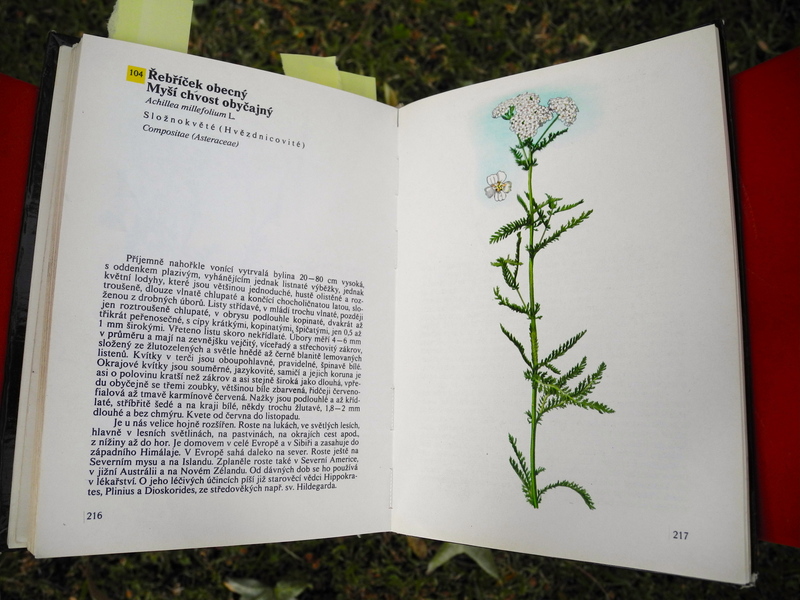 As I leafed through the pages I was excited to see full page illustrations of native wild plants coupled with a full description of them written in Czech. Okay, so I cannot read Czech, but I began to feel giddy, and got even more excited when I saw the Latin name was listed for each plant. With Latin as my gateway, I would be able to research these plants!!! So now this book is mine! A few days earlier, I’d been happily walking through tall grasses when I’d spied a beautiful dainty laced topped flowering weed with fern-like leaves. It was trying to be inconspicuous, but since I have developed a talent for looking for small things as I wander, I was able to snap the weed’s portrait, as seen above. I found it! 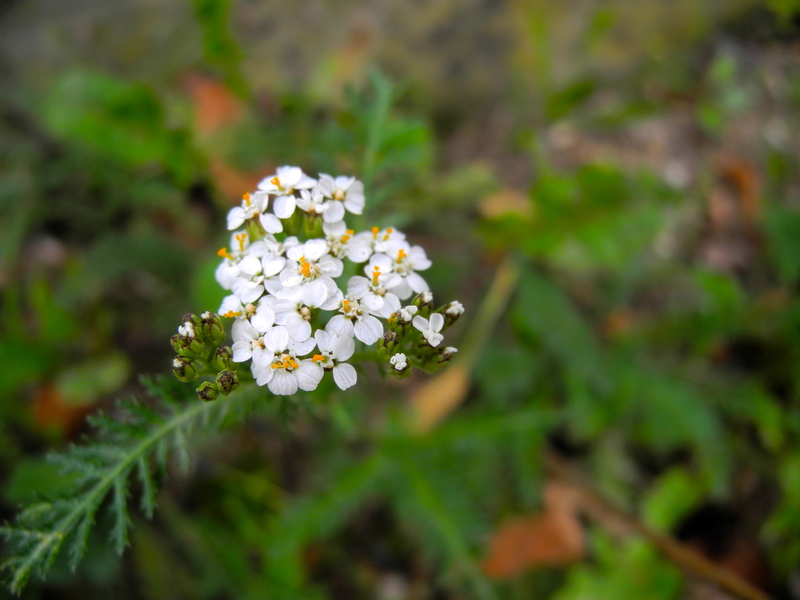 In Latin it is Achillea millefolium, L., and in English: Common Yarrow, a flowering plant in the family of Asteracae. So I celebrate tonight, reveling in a search brought to fruition. Thank you, steep cobblestoned street which held a treasure for me. Thank you Prague! Thank you weed! Thank you Aina! You should have seen me do my happy dance! In sensible walking shoes, of course!!! Thank you Jane! I was absolutely giddy when I found this book! But Lordy, it’s time consuming to identity plants, as you would know so well! I’m happy you liked this post! Previous PostPrevious Saturday – Time to Play!